ST. LOUIS, MO - Nationally acclaimed trio Time For Three (Tf3) will help the Community Music School of Webster University (CMS) celebrate 90 years of music education with a concert at 7 p.m. Thursday, March 31. This will be the first time the group will perform in St. Louis. 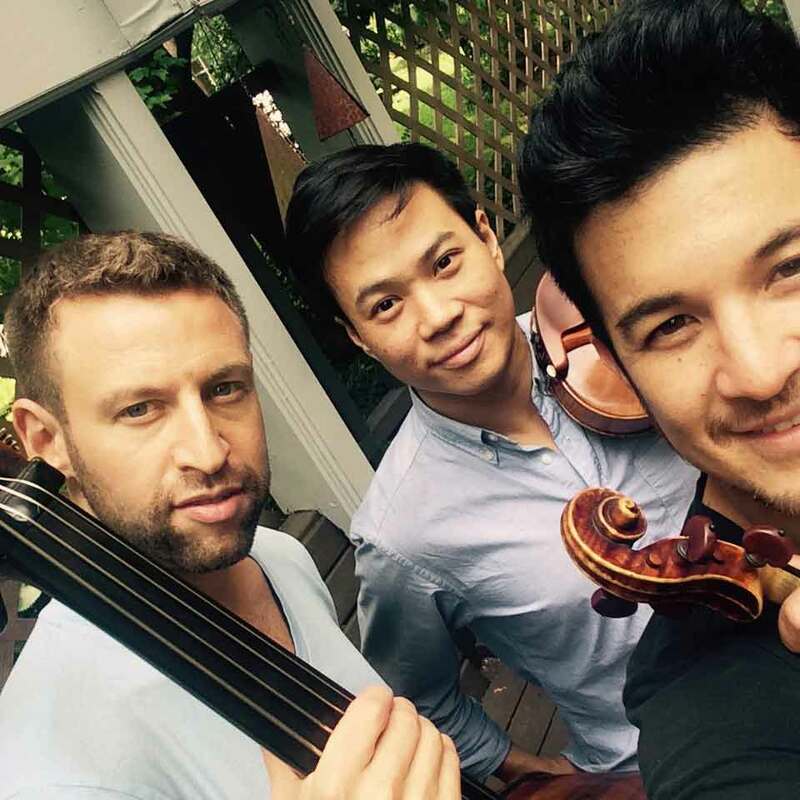 The classically trained trio (Nicholas Kendall and Nikki Chooi, violins; and Ranaan Meyer, double bass) defies any traditional genre classification. With virtuosity and showmanship, the trio performs music from Bach to Brahms and beyond, including originals and their own arrangements of everything from bluegrass to ingenious pop-music mash-ups. Though the 90th anniversary concert will serve as Tf3's St. Louis premiere, the group has musical roots in the St. Louis area. Nicholas Kendall is the grandson of John Kendall, a St. Louis-area professor of music who introduced the Suzuki method to the United States. To demonstrate the effectiveness of Kendall’s theories, the CMS Suzuki Ensemble students will make a special appearance with Time for Three. At 6:30 p.m., just before the concert, a celebratory toast will be held in the lobby to recognize the CMS’ 90-year history of music education. Following the concert, the evening with conclude with an after-party for donors and sponsors. Concert admission is $50 or $30, and $12 for children under 12. Admission includes the celebratory toast at 6:30 p.m. Donor and sponsor levels are also available. For more information, visit www.webster.edu/cms90 or call (314) 968-5939. Tickets may be purchased online with a credit card or by mail with a check. All proceeds go to support music education through the Community Music School of Webster University. Besides the concert, Tf3 also will also present the student workshop Follow Your Dreams and Shoot for the Stars! at 4:30 p.m. on March 31. At the workshop, Tf3 will demonstrate their instruments, talk about their musical journey, and reveal their experiences as music students. They will also share their empowerment and bullying prevention music video, which has gone viral on the web. Tf3 encourages young people to find what it is that makes them happy and live it – all while encouraging each other to do the same. The workshop is free and open to the public. Time For Three Concert, 7 p.m.
Tf3 has performed from Carnegie Hall and the famed jazz club Yoshi’s in San Francisco to European festivals, NFL games and the Indy 500. The group’s hit YouTube bullying-prevention video “Stronger” has inspired students across the globe, eliciting features on CNN and the Huffington Post. Since 2009, Tf3 has held a hugely successful residency with the Indianapolis Symphony Orchestra, helping to expand the orchestra’s audience with innovative outreach. Tf3’s debut album “Time for Three” was released in 2014 on Universal Music Classics. The album, with tracks co-produced by Bon Iver’s Rob Moose, showcases the trio’s melody-rich string weave and its uncommon flair for collaboration, with the group teaming with pop singer-songwriter Joshua Radin, jazz saxophone icon Branford Marsalis, Decca cello star Alisa Weilerstein and ukulele ace Jake Shimabukuro, among others. The Community Music School of Webster University is accredited by the National Association of Schools of Music and is a certified member of the National Guild of Community Schools of the Arts. The Community Music School receives assistance from the Arts and Education Council of Greater St. Louis and the Regional Arts Commission.